HBO has renewed its Insecure TV shows for a third season. The comedy centers on best friends Issa (Issa Rae) and Molly (Yvonne Orji). HBO says, they’re dealing “with their own real-life flaws as they attempt to navigate different worlds and cope with an endless series of uncomfortable, everyday experiences.” Season two just premiered on July 23rd. Created by Issa Rae and Larry Wilmore, Insecure also stars Lisa Joyce, and Jay Ellis. The cast also includes Amanda Seales, Natasha Rothwell, and Mason McCulley. Learn more from this multi-show HBO press release. With both series seeing record viewership this season, HBO has renewed the comedy series BALLERS for a fourth season and INSECURE for a third season, it was announced today by Amy Gravitt, executive vice president, HBO Programming. 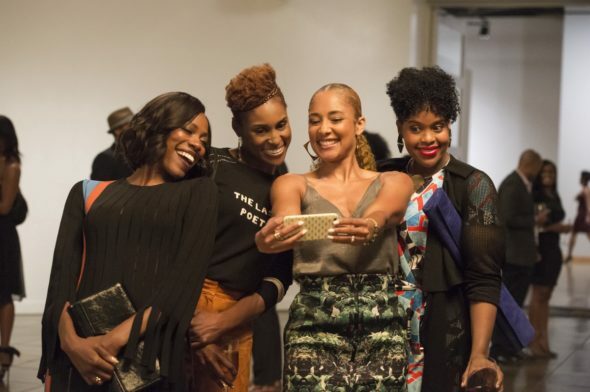 Created by Issa Rae and Larry Wilmore, INSECURE follows the friendship of two black women as they deal with their own real-life flaws while attempting to navigate different worlds and cope with an endless series of uncomfortable everyday experiences. Issa Rae, Yvonne Orji, Jay Ellis and Lisa Joyce star in the show, which returned for its eight-episode second season Sunday, July 23 (10:30–11:00 p.m. ET/PT). Season two credits: INSECURE was created by Issa Rae and Larry Wilmore; executive produced by Issa Rae, Prentice Penny, Melina Matsoukas, Michael Rotenberg, Dave Becky and Jonathan Berry. The second season of Insecure is averaging a 0.60 rating in the 18-49 demographic and 1.19 million viewers. Compared to season one, that’s up by 277% and 187%, respectively. In terms of its demo numbers, Insecure currently ranks fifth, out of the scripted HBO TV shows we’re tracking. HBO also renewed Ballers for season four. Details here. What do you think? Have you been watching the second season of the Insecure TV series? Do you think you’ll tune in for season three on HBO? I love this show!!!! I could watch it all day everyday. As soon as I was done watching the the last episode of season 2, I was googling to see if and when the 3rd season would start. #team issa&lawrence!!!! It is such an amazing show!! Best show I’ve seen in a long time. Keep it coming, no question. I loved Season 1 – am looking forward to Season 2. I’m very happy there will be a Season 3 ! !